JACK: Hi Lloyd. A little slow tonight, isn’t it? LLOYD: Yes, it is, Mr. Torrance. What’ll it be? JACK: Now I’m awfully glad you asked me that, Lloyd, because I just happen to have two twenties and two tens right here in my wallet. I was afraid they were going to be there until next April. So here’s what: you slip me a bottle of Bourbon, a glass and some ice. You can do that, can’t you, Lloyd? You’re not too busy, are you? LLOYD: No, sir. I’m not busy at all. And that’s exactly what Limpd and I did on a Friday night two weeks ago when I brought some recently acquired Scotch Malt Whisky Society of America samples over to his house for a late night drinking session. We sat down at his kitchen table, and we knocked them back! Ok ok. So maybe we didn’t exactly “knock them back”, cause that’s not what we do here at the “It’s just the booze dancing…” Adult Beverage Research Institute. What we do when presented with hand selected, limited edition, single cask Scotch whisky is pour the contents into a proper receptacle (preferably a Glencairn, copita, or white wine glass), evaluate the color and viscosity by holding it up to the light and swirling it slowly in the glass, stick our noses in the glass to determine all of the aromas that are present in the spirit, and then sip it slowly to figure out how the flavors evolve as we drink it down. Is it as complicated as it sounds? Not at all. But is it fun? Yes it is. Yes. It. Is. At this point you’re probably asking yourself what any of this has to do with Lloyd the Bartender and Jack Torrance from Stanley Kubrick’s film The Shining and a whisky review. My answer is this: absolutely nothing! Hey there Booze Dancers! This is Jon from the Pastrami Basket. In the past I know we have traveled across each others blogs so I wanted to toss out an idea. Next Tuesday I am celebrating the anniversary of beginning the picture/cartoon style I usually work with and am reaching out to any bloggers who might be interested in helping me celebrate. Perhaps a little light hearted cartoon to accompany a review? As I’ve mentioned on numerous occasions, connecting with other bloggers has been one of the most rewarding parts of all this blogging business, so when a blogger reaches out and suggests a bit of blog-laboration, I’m totally on board. That being said, please join us in congratulating Jon on his 1st Blogaversary! If you’d like to see more of Jon’s fantastic artistry, click here to visit the Pastrami Basket blog. Cheers to you Jon! Powerful sweetness hit the nose to start with. It became set honey, vanilla pods and toffee bonbons and then lavender freshness with herbal notes of thyme and cut grass. To taste it was hot and sweet. The herbal notes were there too along with orange marmalade bitterness, tobacco and cooling menthol eucalyptus. A good length of finish too. With water the aroma becomes sweeter: baking (pastries, cakes & marzipan), sherbet, lemon icing sugar, rhum agricole, but also an earthy note that took us to summer gardens. Water calms down the taste and offers cake mixture dough, sweet tobacco and orange pith in the finish. From the distillery that is the closest to Grantown on Spey. Limpd: Very astringent at first (funny thing about a 61% ABV whisky). Once I get past that, I’m getting lots of citrus (lemon peel), some floral notes (honeysuckle), vanilla, and butterscotch. G-LO: Wow that smells good! Satisfyingly sweet is a perfect description of the nose on this one. I’m getting salted caramel, butterscotch, nutmeg, ripe bananas, and a touch of vanilla. Better yet, I’m getting a hint of vanilla fudge! Limpd: Very full flavored with an almost syrupy mouthfeel. Good bit of alcohol and cinnamon on the tongue. Still has a lot of sweetness and very little burn in the finish. Lots of sugar cane and vanilla from start to finish. With water, the alcohol burn is diminished and there is much more of a spicy texture up front that follows through almost to the finish. G-LO: Definitely has some weight to it with a mouthfeel that is more than just a touch on the oily side. Very sweet at the onset with those salted caramel notes front and center. Heats up at mid-palate with a soothing dose of baking spices (ginger snaps perhaps?). The finish is sweet, spicy, and oh so delightful with all of these flavors lasting for a real long time. 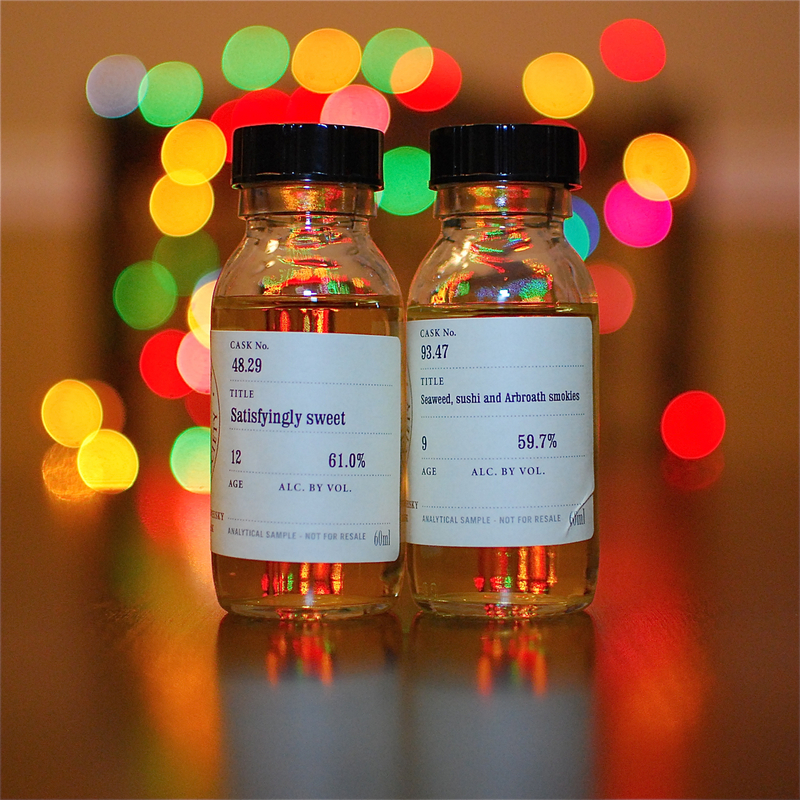 The buzz on this one has been crazy positive among our peers on the whisky blogosphere (check out The Malt Impostor and How To Drink Whisky’s reviews for alternate takes), and we gotta admit, they are so so right. This was absolutely delicious! Please Scotch Malt Whisky Society of America, can we have some more? The nose seemed unusual – salted almonds and rice crackers; seaweed, sushi, and Earl Grey tea; smoked sausage, tar, hospitals, garage workshops and farmyards. The unreduced palate was enormous – tar, smoke and ash – big time; also salty liquorice, menthol, Arbroath smokies and the seaweed found in Japanese rice crackers. Adding water brought the nuttiness and sweetness forward on the nose; we also identified flying saucers, soap and dried strawberries. The reduced palate was still interesting but more tamed – vanilla sweetness, tongue-tingling ginger and cured sausage with subtle caraway and mace flavourings. The distillery is owned by the Loch Lomond Distillery Company. Color: Also pale golden yellow. Limpd: Hillshire Farms Sausages, sea spray while sitting along the waterfront, and then a little sweetness. G-LO: Smells like a tour of Scotland in a glass. I’m getting a lightly briny maritime scent, a whiff of peat, toffee, cocoa, and a bit of menthol off in the distance. Limpd: Good bit of alcohol up front. A little spicy with a bit of peat (think salty barbecued meat kind of peat!) followed by a bit of sweetness. With water, alcohol recedes as well as the spice and mild smoked meat flavors. Mint and a nice amount of sugar cane sweetness make an appearance along with a healthy (healthy?) alcohol burn. G-LO: Lighter bodied than the 48.29. Salted vanilla custard in the beginning if there’s such a thing. Wintergreen type heat at the middle (quite soothing). A touch of smoke shows up at the end with all of the sweet, spicy, and salty notes coming together as well. Those minty notes show up again in the aftertaste. Looks like we have another winner! Much like Springbank, our past samplings of Glen Scotia have left us with the impression that Campbeltown is a bit of a Scotch whisky hybrid, i.e. it has some elements from the maritime regions of Islay, Skye, and Jura along with the rich fruity elements of the Highlands and Speyside. We like that in a whisky! (once again, check out The Malt Impostor and How To Drink Whisky’s reviews for alternate takes). Many thanks to the Scotch Malt Whisky Society of America for sending us these delicious whisky samples! I love the Shining reference! And I have a question. When Limpd says “hillshire farms sausages” as a tasting note, how do you resist rebutting with “dude! No! t’s Jimmy Dean all the way!” Unless, perhaps, Limpd was completely correct. Happy belated Pastrami day to you sir. And those single tastings look exactly like medicine bottles. Which is what I usually call alcohol. But if they were in those bottles I could probably bring them to work. Damn skippy! It’s the only form of therapy that I endorse. Huzzah!